Lushak gra-Ragdam is a hostile Orc necromancer hailing from the island of Olenveld off the coast of Skyrim. She can be found within Brittleshin Pass during the related quest. Lushak carries a copy of Arkay the Enemy and The Black Arts On Trial. You will need to kill her and her companion Ivara of Olenveld during the related quest. 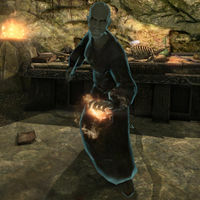 The Staff of Hasedoki: Locate a legendary staff that's been smuggled into Skyrim. This page was last modified on 6 October 2018, at 19:18.